My DJ 360 replica Build - FULLY Painted!!! Thread: My DJ 360 replica Build - FULLY Painted!!! Well anyway I ordered my kit from DJ last week, and since then have picked up a donor N/A not too far from me. 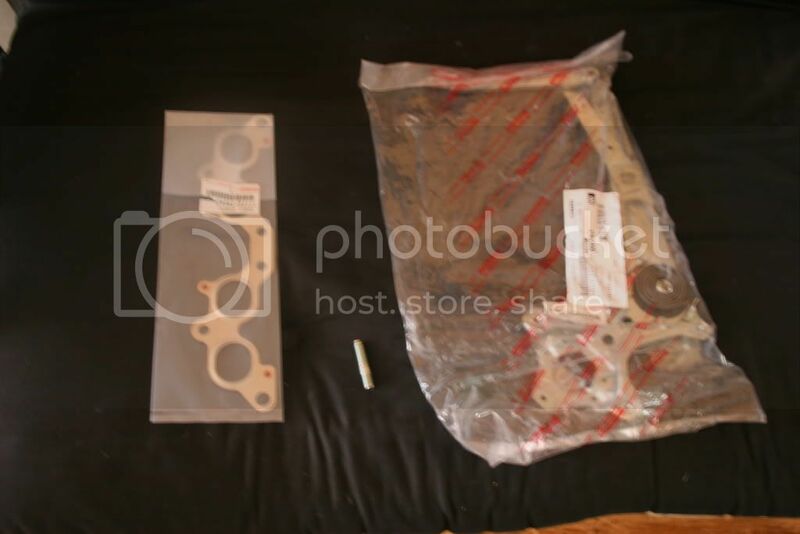 Anyway I should be replacing a broken stud on the block (engine to maniford) and a leaky manifold gasket (these should be arriving from toyota tomorrow). Also the drivers side window mech was broken, so that will be replaced hopefully tomorrow too. 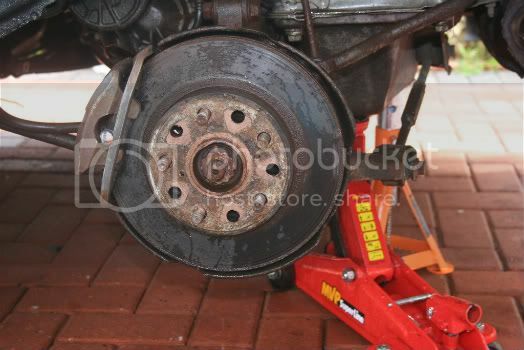 Then its mot, the car should pass I can't really see any problems, but we will see. I also (two days ago) drained the cooling system and renewed it with new (red) coolant. The car sounds and runs beautiful (except of cause the slight leak in the manifold. Here are some pics of the car as advertised. Nothing shas changed since I got it anyway. 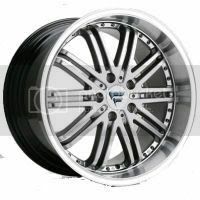 The wheels I will be fitting. Removed the stud (used a special stud removing tool, worked a treat), and got the gasket off (after a lot of WD40 and a torque wrench). 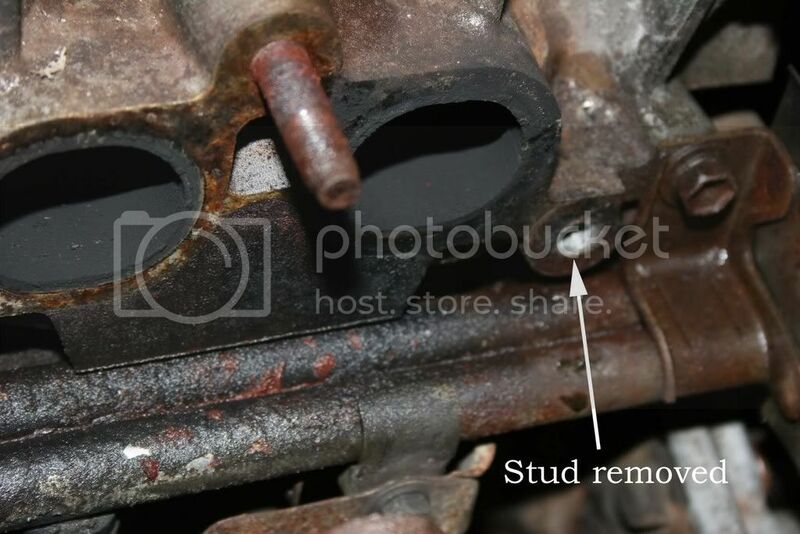 Here you can see the missing stud after removal. I should have a new stud from toyota tomorrow to fit and a new manifold gasket. Well this is what ihave been upto the last few eves. 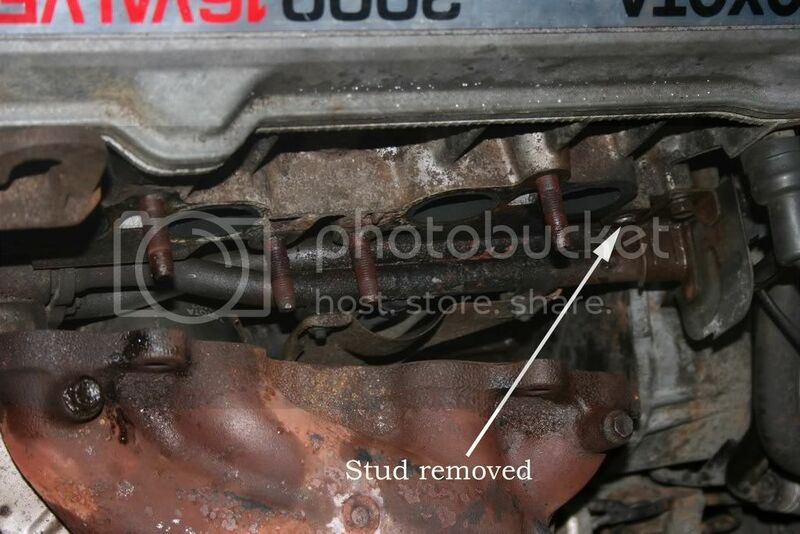 Replaced the leaky manifold gasket and broken stud. Also replaced the broken window mechanism. 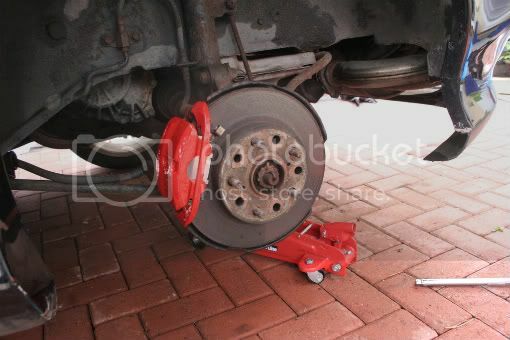 I also painted one caliper (trial) in red. This is the result. 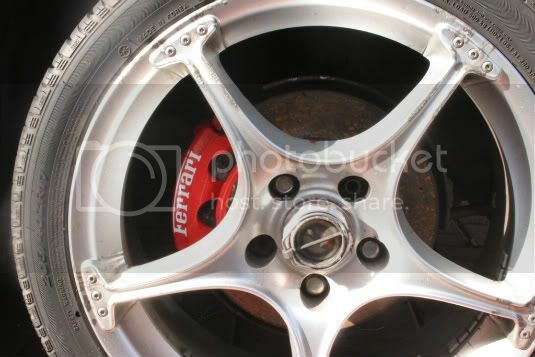 Caliper cleaned and ready for paint. 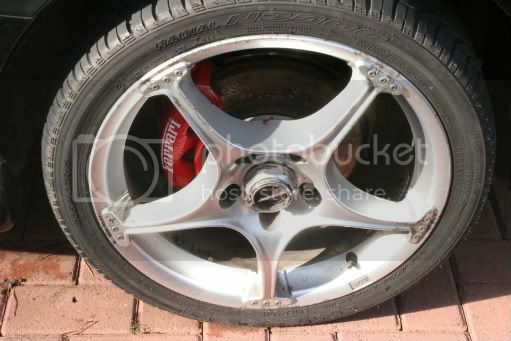 I got some nice Ferrari caliper stickers. 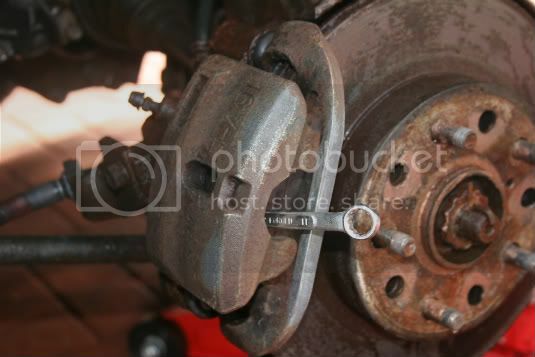 Well I MOT'ed the car today, passed Only failed on handbrake problem due to seized rear calipers. The garage took them apart and sorted it all out . I was getting worried, cause it can be costly. Guud Luck to you and may you produce the perfect 360 rep! 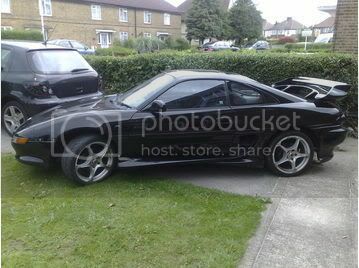 What year MR2 is that and is there any difference to MR2 from other years? wondering if the angle and width of the front windscreen identical to that of the furrarii? ??? And thanks for sticking with the build posting. I think I might have said enough by now. 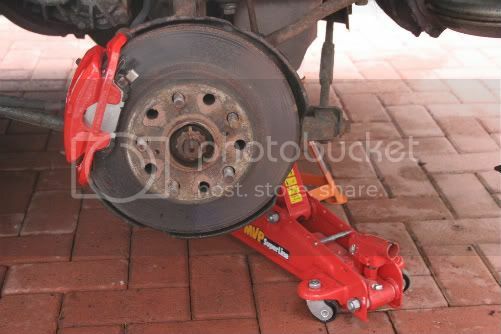 Glad to see you got through the MOT without too much trouble. I think you got your car for an absolute steal!!! 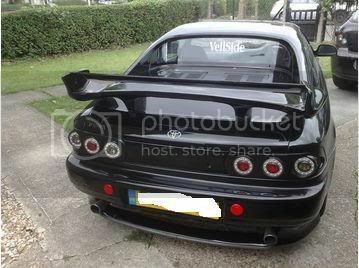 And by the time you sell off the rear spoiler, rear lights etc it shouldn't owe you much! Sooo my question is.... What's the difference between the DJ GTA and the revised DJ GTA kit? Dave had a build on here about a year ago (I think it was his sons car) and that looked like great fun. I think the build thread got lost a few months ago though after a server crash. Hi dazzarai im really wating to see you finish the build...iwanna see what is the easiest kit ,the DJ or the DNA????? iwant you to tell me how much did you get the whole kit?? ?i saw it for 6390 on there site?? is it ok if i ask for pics of panels and the parts of the kit..i want your advice on buying an easy not expensive 360 kit.you saw the 2 kits. Thanks alot. 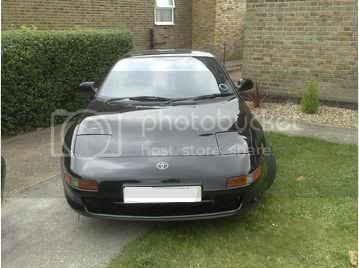 My Mr2 is a 1990, im not really that knowledgeable on the MR2 to be honest, I do know that mine is classed as a Mrk2. I think Rev 1? On the Davejones website you can see some pics of his kit vs a real 360 so you can compare the differences. I havent seen the kit next to a realone in the flesh myself, but i have seen a build one (demo) and it was very good. Gyroscopically balanced fully enclosed bike from the 80's??? Fully motorized disapearing license plate. Very Cool. Fully developed kitcar classifieds website for sale!